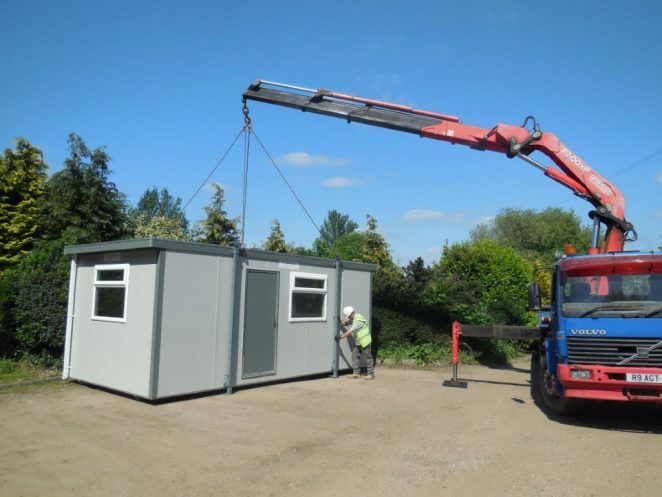 We’ve supplied Portable Offices to Hanson Concrete for 20 years! We deliver your portable office, whether you hire or buy. We can supply portable offices and cabins for sale and hire and offer a fast delivery service. We deliver by lorry and can have most units in place quickly with the use of our lorry mounted crane. Then it’s just a matter of connecting electricity via a quick couple plug socket and your portable office or cabin is ready to use. We have a large selection of portable offices, sales offices and marketing suites to hire and buy and we can supply a variety of sizes and multiple units for stacking if required and deliver them to your chosen site prompty. This particular portable office was a temporary office space that we delivered to our client’s car park. For further information on our portable offices call 01206 212505.